I am not a parent but I am sure parents of adult children have asked "How can we pray God's best for our children after they leave our homes and grow up, have their own families, etc?" You never stop being a parent, I have been told by many friends and by my own parents. I understand how tough it must be to have to let your children make their own decisions. 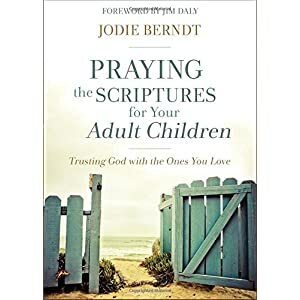 In this book by Jodie Berndt she focuses on a different stage of adulthood in each of the chapters with insight and encouraging stories from parents. I got a lot of insight from the "Prayer Principles" through out the book and I loved the section at the end of each chapter that gave specific prayers for you and then for your children. You can just fill in the blanks with their names and pray the prayer. So many times we don't know what to pray and this gives really great prayers to help. I recommend this to anyone who had adult children, in any stage of adulthood or any age and/or anyone who wants to help those with adult children. This book was provided to me by Handbar Publishing for my honest review. All opinions are my own.